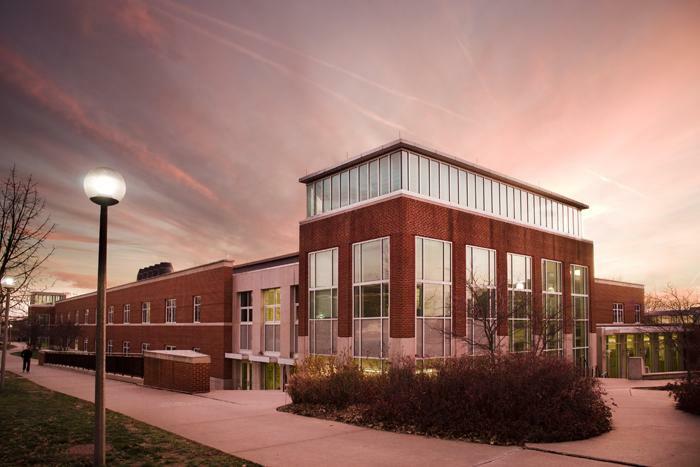 Truman is one of only eight Missouri universities to be included in a joint $5 million grant from the National Science Foundation’s Louis Stokes Alliances for Minority Participation (LSAMP) program. 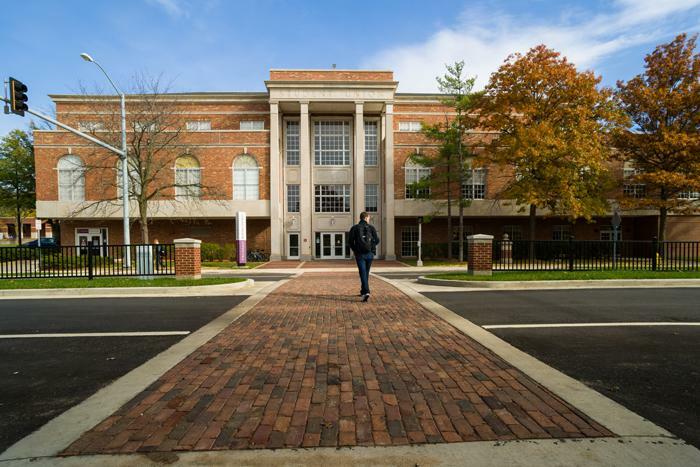 As part of the grant, Truman will receive $350,000, which will be used in developing educational solutions to address a gap in the enrollment, retention and graduation rates of underrepresented students. Missouri’s LSAMP grant aims to double the number of underrepresented minority science, technology, engineering and math graduates by 2021. Underrepresented minorities are identified by LSAMP as African-Americans, Hispanic Americans, American Indians, Alaska Natives, Native Hawaiians and Native Pacific Islanders. 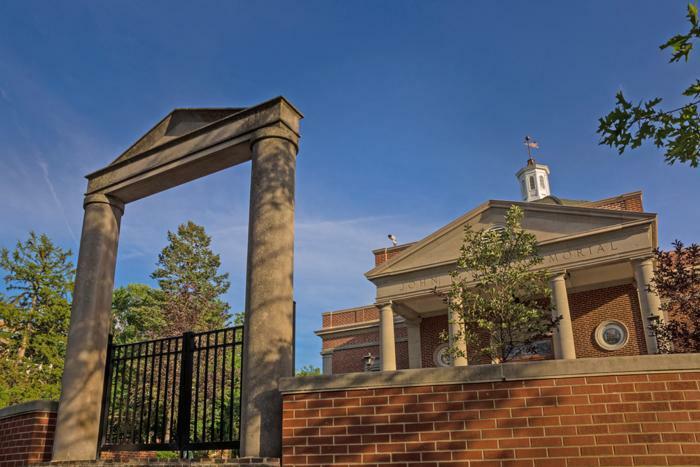 Other universities joining Truman to receive funding from the grant include Harris-Stowe State University, Lincoln University, the University of Missouri-Columbia, the University of Missouri-St. Louis, Washington University in St. Louis, the University of Central Missouri and St. Louis Community College. 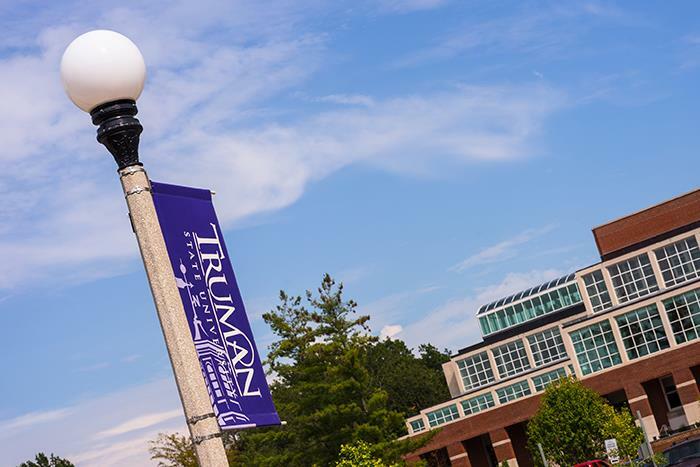 Truman students will also get the chance to participate in unique activities and events taking place at the partner campuses. Cortney S. Rodet, associate professor of economics at Ohio University, will present “Voting: Why Elections Might Not Deliver” in an open forum at 7 p.m. Nov. 4 in Violette Hall 1010. The lecture will address questions such as: why do we vote? ; who do we vote for? ; and how do we know we can trust them? ; as well as, do elected officials continue to represent those who elect them? The forum is free and open to the public. Rodet’s research focuses on expression, trust and voter behavior. He uses economic laboratory experiments and behavioral economics to explore these and other accountability issues related to economic support of political representatives. He did post-doctoral research at the Economic Science Institute and spent two years with the Center for Free Enterprise. Questions such as those posed above are embodied in principal/agent problems and studied using public choice economics. 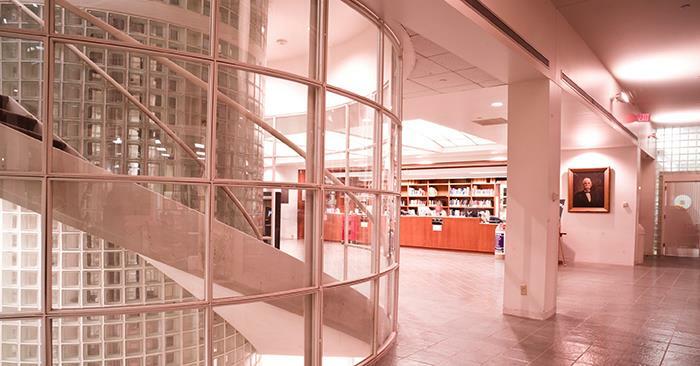 Rodet regularly presents seminars and workshops for the Center for Free Enterprise, where students from all over the country meet to engage each other on topics and readings they might not see in a standard economics course. While at Truman, Rodet will also present a shortened version of his seminar “Humanomics: Exchange and the Human Condition.” In this presentation, students explore both what makes a nation rich and a person good. While exploring these and other questions about markets and ethics, students challenge the perception of economics as distinct from the humanities. Interested students should contact David Gillette for more information. Truman will celebrate Sustainability Week Oct. 23-28 as part of the University’s continuing efforts to encourage lasting ideals to meet the needs of the present while also securing prosperity in the future. The highlight of the week will be Michael Urban’s presentation, “The Science Behind Climate Change,” at 4 p.m. Oct. 25 in Violette Hall 1000. Urban is an associate professor and chair of geography at the University of Missouri-Columbia, and his research specialty is climate change, water resources and environmental management. The focus of much of his work has been on how river systems and water resources have changed in response to patterns of climate, human behavior and human impacts on the environment during the past century. His recent work involves modeling 20th and 21st century climatic water budgets across the United States and northeastern China. Urban has attended the United Nations Climate Change Conference as a representative of the Association of American Geographers. He is interested in how a changing climate will affect water resources and environmental management on local and regional scales. Some of Urban’s published works include topics such as how the perception of natural environments influences public policy, the ethics and philosophy behind environmental restoration, and the effect of agriculture on the physical integrity of river channels and stream networks. Truman’s Sustainability Committee strives to dedicate its resources to coordination, development and engagement of sustainable practices. Details for other events taking place throughout the week can be found below or on the Truman Sustainability Facebook page. For students interested in the minor, this is a chance ask questions and meet each other. This event is hosted by PSAC and the ENVS minor committee. The Sustainability Tag Event will take place from Oct. 23-28. 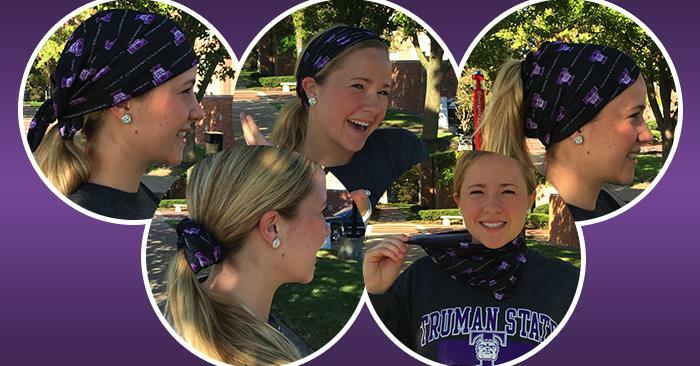 Post a picture on Facebook, Instagram or Twitter with the hashtag #trumansustainability. The person with the most tags will win a free bike from the Bike Co-op. Check out the Truman Snapchat account Oct. 26 for more information about that day’s events and the University’s sustainability efforts. 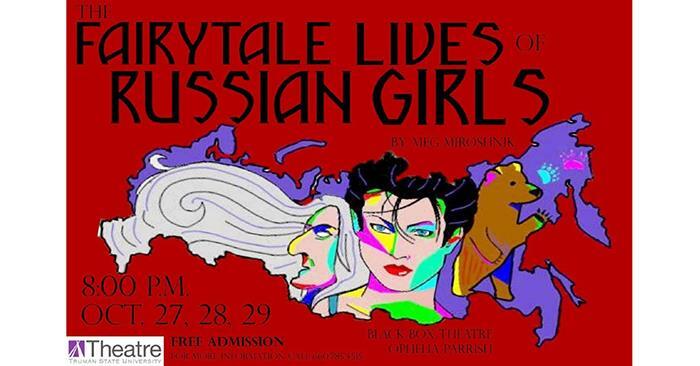 The Theatre Department’s fall lab show, “The Fairytale Lives of Russian Girls,” will be performed at 8 p.m. Oct. 27-29 in Ophelia Parrish’s Black Box Theatre. “The Fairytale Lives of Russian Girls” follows Annie, a young adult returning to native Russia to lose her American accent. Underneath a glamorous post-Soviet Moscow studded with dangerously high heels and riches galore, she discovers an enchanted motherland teeming with evil stepmothers, wicked witches and ravenous bears. Annie must learn how to become the heroine of a story more mysterious and treacherous than any childhood fairy tale: her own. The subversive story haunts the audience and carries a powerful message for young women living in a world where not everything lives happily ever after. 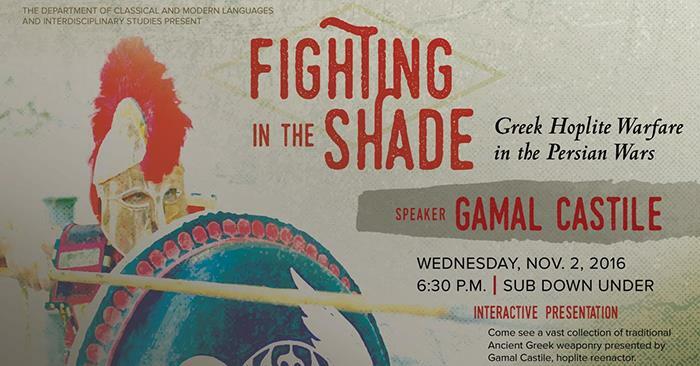 Professional hoplite reenactor Gamal Castile will demonstrate ancient Greek battle tactics in an interactive presentation, “Fighting in the Shade: Greek Hoplite Warfare in the Persian Wars,” at 6:30 p.m. Nov. 2 in the Student Union Building Down Under. A hoplite was a heavily armed foot soldier of ancient Greece. Castile will demonstrate ancient Greek and Persian military tactics, complete with authentically recreated weapons and armor he designed and constructed himself. The scope of this presentation concerns the evolution of the Greek hoplite: how their weapons and battle tactics culminated in the victory over the Persian invasions of Greece, allowing for the flourishing of Greek culture in the classical period. Audience members will have the opportunity to participate in the presentation. This event is free and open to the public. It is sponsored by the Department of Classical and Modern Languages and Interdisciplinary Studies. More information about this event and other activities sponsored by the School of Arts and Letters can be found at facebook.com/trumansal. This year’s Community Partner of the Year award went to the LIFE Ability Center during the appreciation luncheon, Oct. 18. 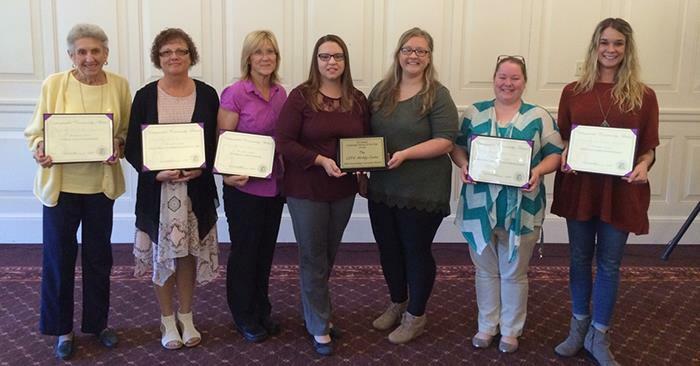 The LIFE Center, which teaches valuable life skills to individuals with developmental disabilities, was nominated by eight different Truman organizations. The center is operated by the Adair County SB40 Developmental Disability Board and has been serving the community since 2009. Other nominees included Nancy Price-Manor Care, Kirksville's Habitat for Humanity, Head Start, the "I Think I Can" Foundation, the Kirksville Parks Department and the Thompson Campus Center. The Community Partner of the Year award is given by the SERVE Center to an outstanding community member or agency that has worked closely with the University to promote public scholarship amongst Truman students. For more information on the Community Partner Award, visit serve.truman.edu/community-partner-award-nomination. Nominees for the Community Partner of the Year Award take a picture together during the appreciation luncheon Oct. 18. LIFE Ability Center was the recipient of this year's award. The Forensic Union traveled to the University of Central Missouri Oct. 15-16 to compete at the Missouri Mule and Dale Carnegie Swing, earning six qualifications for nationals in April. With 10 competitors, the team brought home second place debate sweepstakes for the Dale Carnegie part of the weekend and third in overall debate sweepstakes for the whole weekend. Freshman Thomas Segroves placed second in the novice division of Lincoln-Douglas debate after making it to elimination rounds with a perfect preliminary record. Segroves was also recognized as the third-best speaker in the division. Senior Mahliyah Adkins-Threats placed fifth in afterdinner speaking, and senior Adrien Zambrano placed fifth in impromptu speaking and second in prose interpretation. Adkins-Threats returned to afterdinner speaking finals and placed third. She also advanced to poetry interpretation finals and placed sixth. Sophomore Johnathan Christy was recognized as the sixth-best speaker in open Lincoln-Douglas debate. Junior Connor Stewart earned a perfect preliminary record in Lincoln-Douglas and ended the day as an octofinalist. In novice Lincoln-Douglas, Segroves returned to elimination rounds with Luke Frogge. Both advanced through semifinals to close out the final round. Frogge was recognized as the second-best speaker in the division while Segroves was first. Author Jack Smith will be reading from his 2016 novel, “Being,” as part of the for·Words series sponsored by the Department of English and Linguistics. The event will take place at 4:30 p.m. Oct. 24 in the Del & Norma Robison Planetarium. Smith has published three novels including “Icon” and “Hog to Hog,” which won the 2007 George Garrett Fiction Prize. 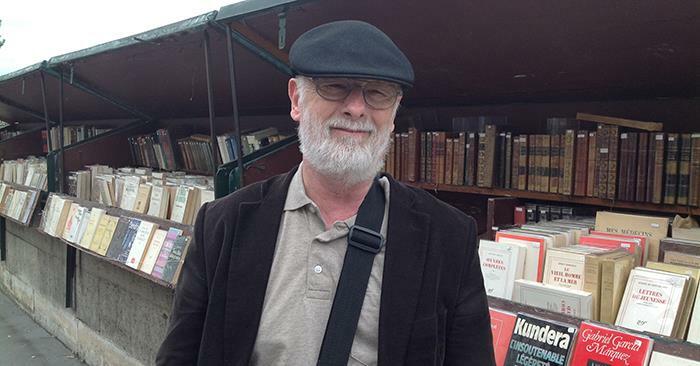 He has published stories in a number of literary magazines, including Southern Review, North American Review, Texas Review, Xconnect, In Posse Review and Night Train. His reviews have appeared widely in such publications as Ploughshares, Georgia Review, American Book Review, Prairie Schooner, Mid-American Review, Pleiades, the Missouri Review, Xconnect and Environment magazine. He has published a few dozen articles in both Novel & Short Story Writer’s Market and The Writer magazine. His creative writing book, “Write and Revise for Publication: A 6-Month Plan for Crafting an Exceptional Novel and Other Works of Fiction,” was published in 2013. His coauthored nonfiction environmental book, “Killing Me Softly,” was published 2002. In addition to his writing, Smith was fiction editor of GHLL, an online literary magazine published by Truman for 25 years. More information about Smith, for·Words events and additional activities sponsored by the School of Arts and Letters can be found at facebook.com/trumansal. 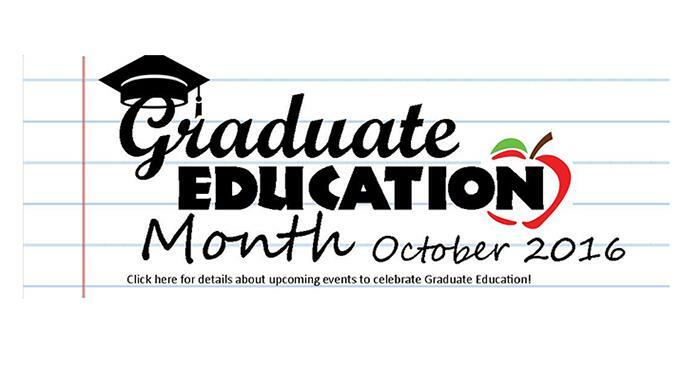 To celebrate Graduate Education Month, Truman’s eight graduate programs will be hosting public events throughout October. Additional details and information for each event can be found at truman.edu/majors-programs/graduate-studies/graduate-education-month. The Academic Professional Development Center is hosting a lunch and presentation for faculty at 11:30 a.m. Oct. 26 in the Student Union Building Alumni Room. Dana Vazzana, APDC director, will discuss success and retention strategies for students who are academically well-qualified yet unsuccessful in class. The presentation will cover strategies to use in class to help those students become more successful. RSVP here by 12 p.m. Oct. 25. In addition to this presentation, APDC will provide another lunch at 12:30 p.m. Oct. 27 in the Student Union Building Conference Room. Attendees will watch the Magna Online live webinar “Learning Assessment Techniques: How to Integrate New Activities that Gauge What and How Well Students Learn.” More information about the webinar can be found on the Magna website. The seminar is expected to last until 2 p.m. RSVP here by 12 p.m. Oct. 26. For more information about APDC, visit the center’s website. The International Club is hosting a cultural pageant at 7 p.m. Oct. 29 in the Student Union Building Georgian rooms to bring together students from all different nationalities and cultures. The participants, from Asia to South America, compete to show off why they love their culture, why they are proud of it and how it is impacting the world. Tickets are $3 and will be sold from 12-4 p.m. Oct. 26-27 in the Student Union Building. The Communication Disorders Association is collecting diapers and wipes for local families in need at the Speech and Hearing Clinic. Diapers in larger sizes are especially in demand. Families can visit the Salvation Army from 9 a.m.-12 p.m. Oct. 28 to receive diapers. For more information, contact Greta Roettgen. 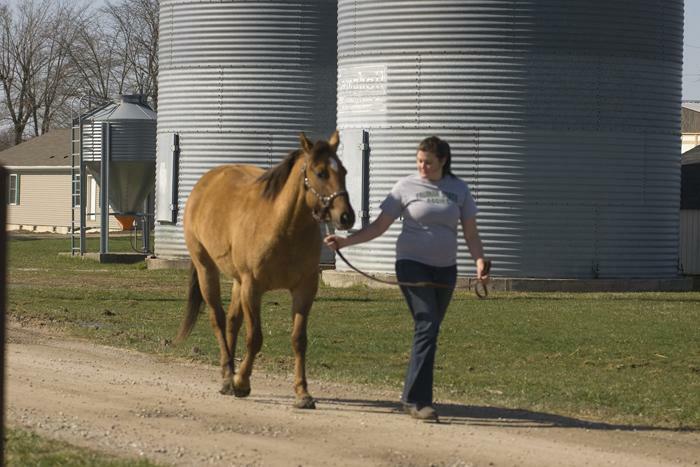 The workshop, “What Horses Can Do For Your Health,” will be offered at 3:40 p.m. Oct. 28 at the University Farm. The workshop, open specifically to Truman students, has been repeatedly popular with those who participate. Although participants will not be riding the horses, they will have the opportunity to interact closely with the horses during the session. The session will allow them to experience first-hand how horses help humans mentally process and how horses can teach self-discipline and self-worth. The event is limited to the first 15 Truman students who sign up here. Questions may be directed to Beth Miller. The Food Bank for Central and Northeast Missouri is participating in the Food for Fines event at Pickler Memorial Library until Oct. 30. Students with overdue library fines can have up to $1 waived for each food item donated to the food bank. All non-perishable packaged items will be accepted, including pasta, cake mixes and boxed meals like Hamburger Helper. Food will not replace lost, damaged or billed items. Children from the Kirksville community will have the opportunity to celebrate Halloween in a safe and friendly environment during the annual Trick-or-Treating in the Halls event, starting at 6:30 p.m. Oct. 31. Hall residents interact with the trick-or-treaters by giving out candy. More than a hundred residents sign up to participate every year. Markers to indicate trick-or-treating will be hung up outside of each resident’s door or on-campus apartment. For more information, contact RHA programming chair Bria Berry. Truman’s National Collegiate Hispanic Honors Society, Sigma Delta Pi, will be hosting a variety of events designed to share and inform about Hispanic culture. 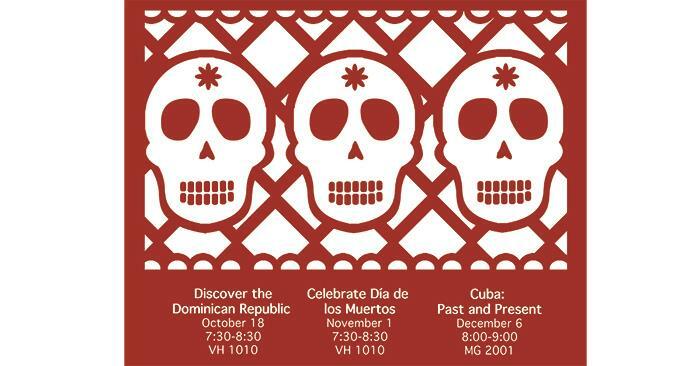 Students and faculty will present on Día de los Muertos and Cuba. Refreshments will be provided. A panel of students and staff from Cru and the Baptist Student Union will be answering questions submitted by students about the Christian perspective at 8 p.m. Nov. 1 in the Baptist Student Union. Students of any background are invited to the event, “Why Doesn’t God Care? Life’s Tough Questions,” and are encouraged to prepare questions. Refreshments will be provided. For any questions, email Grant Wallace. The McNair Program has opened applications for undergraduate students interested in pursuing a Ph.D. degree. The program cycle is designed for sophomores and juniors, but any student who has been involved in undergraduate research is encouraged to apply. Staff can help students determine whether they are eligible and whether the program may be a good fit for them. The program provides paid summer internships, graduate school preparation, faculty mentoring, academic advising and the opportunity to conduct an original research project. For questions, email mcnair@truman.edu or call 660.785.5393. Truman State University Foundation scholarship applications for students in the spring 2017 semester are now available. Applications are online and are due by midnight, Nov. 3. To apply, log in to TruView, go to the Student Tab, Student Finances, Foundation Scholarship Application. Complete the personal information page and then follow the two-step process to select scholarships for which to apply. Applications can be revised at any time prior to midnight, Nov. 3. This application period is for Foundation scholarships that have not yet been awarded for 2016-17. Applications for the majority of Foundation scholarships will be available in February for the 2017-18 academic year. The Communication Disorders (CMDS) Department will host a Graduate Student Open House from 10 a.m.-1:30 p.m. Nov. 5 in the Health Sciences Building 2203. All prospective students interested in pursuing a master’s degree in communication disorders from Truman are invited to attend. Information regarding the CMDS graduate program, the profession, employment opportunities and funding for graduate school will be provided along with the opportunity to meet faculty, alumni and students of the program. RSVP to Connie Ikerd, department secretary, at cikerd@truman.edu. 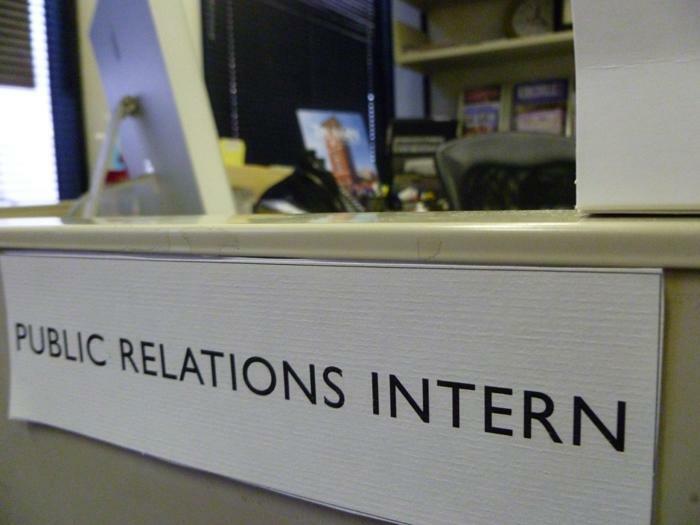 The Truman Public Relations Office is now accepting applications for the full-time spring 2017 internship position. To apply, send a resume, an advising transcript, two writing samples and contact information for two on-campus references to the Public Relations Office, McClain Hall 202, no later than Nov. 4. For questions about the internship, contact Travis Miles at tmiles@truman.edu. The study abroad playlist on Truman’s YouTube Channel provides a unique way to learn more about opportunities available through the University. Student testimonials offer a glimpse of what it is like to study abroad and describe how that experience changed their lives. This week’s featured video looks at opportunities to teach English abroad. Truman’s social wall integrates all of Truman’s major social media accounts including Facebook, Twitter, Snapchat, YouTube and Instagram. The wall arranges Truman’s most recent posts into a convenient feed to be all viewed at once. This feed can be found at social.truman.edu. 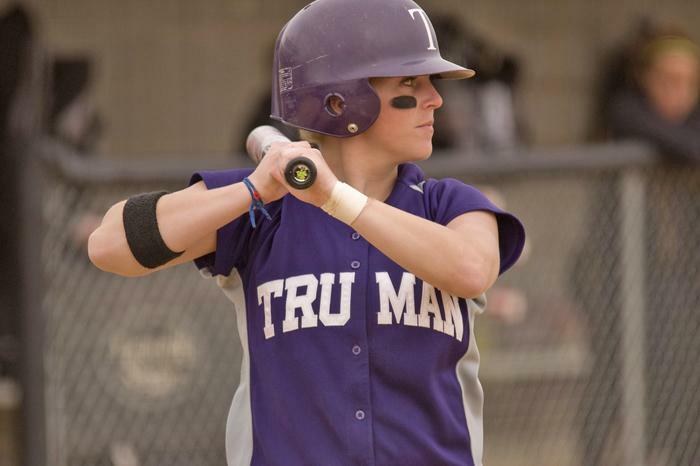 The softball program will host both a prospect camp, Nov. 12, and a pitching camp, Nov. 13. Grades seven through 12 can participate in the prospect camp, which runs from 9:30 a.m.-3:30 p.m at the softball field or inside Pershing Arena. Entry costs $100 and includes a t-shirt. There will be a one-hour break for lunch (not provided) at 12 p.m. Day-of registration is an additional $5. The pitching camp, which runs from 1:30-3:30 p.m. Nov. 13 in Pershing Arena, is open to grades six through 12. Registration is $50, includes a t-shirt and day-of registration is an additional $5. More information can be found at the program’s website. 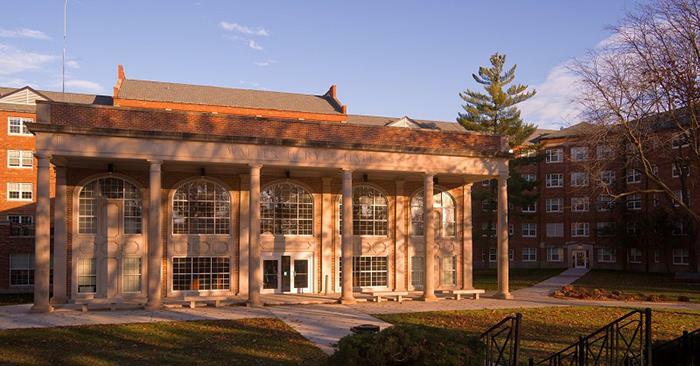 The Missouri Folklore Society will host its annual conference in Kirksville Nov. 3-5, and society members, students, faculty and staff will present research or showcase a particular strand of folklore. Dozens of presentations will highlight the rich cultural traditions of the state, focusing on the northeast region. Features of the conference include the Missouri Folklore Society Dinner at 5:30 p.m. Nov. 3 in the Student Union Building Georgian Rooms, with Sodexo providing specialized catering using the MFS Journal’s Missouri Foodways issue. Loretta Washington’s performance and book launch for “My Corner of the Porch,” a For·Words event, will be at 7 p.m. Nov. 3 in the Student Union Building Georgian Rooms. Following the performance, the Folklore Society will host an open jam session. The conference will also feature the Schroeder contest, which will provide $125 scholarships for the best papers submitted on Missouri folklore or folk life. Throughout November, the Kirksville Arts Association will host a folk arts exhibit. The visual arts of Kirksville’s new African and Latino immigrants will be featured and foregrounded along with the works of local Hands of Friendship quilters, regional musicians, artists and basket weavers. The exhibit is free and open to the public for the entire month. It is co-sponsored by the Missouri Humanities Council, the Kirksville Arts Association, Truman’s Multicultural Affairs Center and the Missouri Folklore Society. The conference is free and open to the public. For more information, visit the Missouri Folklore Society’s website. In separate events, faculty members Bob Matthews and Chad Montgomery will each discuss their experience being on sabbatical last year. Matthews will present “Concurrency and Computing” to the Association for Computing Machinery at 6 p.m. Oct. 24 in Violette Hall 1146. Montgomery’s presentation, “Opportunities for High Impact Experiences for Lifelong Leaners,” will take place at 12:30 p.m. Dec. 2 in Magruder Hall 2001 as part of the Biology Seminar Series. The Public Relations Office is selling spirit bands for $2 a piece. Spirit bands can be worn more than a dozen different ways, including as a bandana, scarf, bracelet, beanie, headbands and more. The office is open 8 a.m.-5 p.m. Mon.-Fri. In McClain Hall 202 and accepts cash or check. Rob Garver, from the Missouri Department of Conservation, is teaching three separate 30-minute archery lessons. The sessions will be at 2:45 p.m., 3:15 p.m. and 3:45 p.m. Nov. 9 in Pershing Building Small Gym. These lessons are free and open to the public. 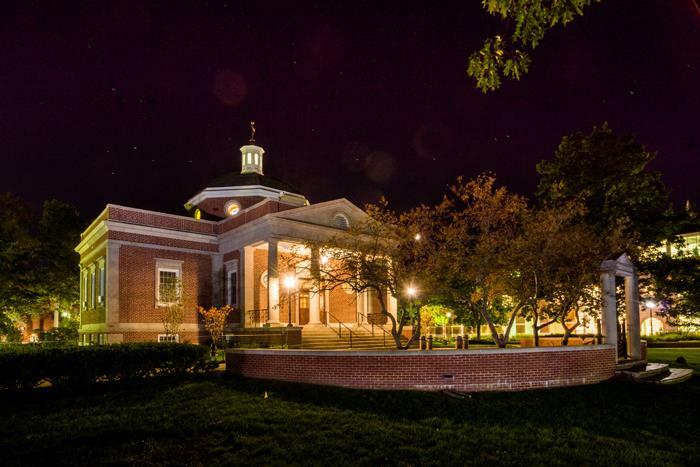 The Institute for American Universities invites Truman faculty to apply for its Resident Fellows Program, which allows visiting professors on sabbatical leave to tap into IAU’s existing resources, such as faculty, classroom space, housing, library and archives. The fellows program is available in Aix-en-Provence, France, and will be available in Barcelona, Spain, for the 2018-19 academic year. Interested faculty should complete the IAU Resident Fellows Application. The spring semester deadline is Nov. 10. For questions about the Resident Fellows Program, contact the Center for International Education Abroad. The U.S. Department of State is now accepting applications for the 2016-17 Critical Language Scholarship program. The CLS program is an intensive overseas language and cultural immersion program for American undergraduate and graduate students that spans 8-10 weeks during the summer. Scholarships are available for more than 20 sites abroad, with language study offered at various levels. To promote access to study abroad, the CLS program covers many of the costs, including: round-trip domestic and international travel, applicable visa fees, room and board, course materials, a small living stipend and U.S. undergraduate academic credit through Bryn Mawr College. To learn more about the program, visit clscholarship.org. For further questions, visit the Study Abroad Office in Grim Hall or email ciea@truman.edu. The University of Limerick in Ireland, in partnership with Truman, is now offering 10 new scholarships as a tuition fee discount to students on the Undergraduate Study Abroad Program in the 2017 calendar year. The recipients of these scholarships will be selected by the Truman Center for International Education Abroad. For more information, visit the Center for International Education in Grim Hall, call 660.785.4076 or email ciea@truman.edu. The application for the Paul and Daisy Soros Fellowship is open and due by 11:59 p.m. Eastern Standard Time, Nov. 1. The Soros Fellowship honors and supports the graduate educations of 30 new Americans each year. Fellows are selected on the basis of merit – the specific criteria emphasize creativity, originality, initiative and sustained accomplishment – in annual national competitions. Candidates apply directly. The program does not depend on recommendations from universities or regional screening, and neither financial need nor distributive considerations are taken into account in the selection process. Current or future graduate students who are 30 or younger, and who are immigrants (naturalized citizens, green card holders, DACA) or children of immigrants, are encouraged to apply at pdsoros.org. The Morris K. Udall Foundation awards scholarships to sophomore or junior students who have demonstrated leadership and commitment to public service in areas related to environmental issues on a local, national or global scale. Students interested in applying should contact Franta Majs by Nov. 18. For more information, visit the Udall Foundation website.